Every two years, countries converge on the selected host city and Olympians compete for the gold. The 2018 Winter Olympics are fast approaching (Feb. 9-25) and will be hosted in Pyeongchang, South Korea. Although my research indicates there are no Native American athletes representing the USA this year, there are several First Nations members representing Canada in the 2018 games, and even as these athletes prepare to compete against the best in the world, other athletes are hard at work training for their chance in the Lausanne 2020 Youth Olympics, the Tokyo 2020 Summer Olympics, and the Beijing 2022 Winter Olympics. In a previous PWNA blog after the Rio 2016 Summer Olympics, we celebrated three Indigenous athletes. Today we provide an update on these athletes and what they’re doing as the 2018 winter games approach. Ashton Locklear, Lumbee, was one of three alternates on the U.S. Women’s Gymnastics Olympic team in 2016. Her teammates stayed healthy throughout the games while she encouraged them, the team earning 4 Golds, 4 Silvers, and a Bronze Medal. Returning home, Locklear hit the gym and competed through the 2017 World Championship finals. In February 2017, Locklear became a Nike N7 Ambassador, one of the “…outstanding Native American and Aboriginal athletes who embody the power and spirit of N7, believe in the power of sport and encourage those around them to do the same.” During the Montreal World finals, an unfortunate shoulder injury required surgery. Recovery and rehabilitation for an injured athlete is equally as grueling as training when healthy, but Ashton’s goal remains the same: to complete at the highest level and earn her spot for the 2020 Summer Olympics! Rickie Fowler, Navajo, was one of four golfers representing the U.S. Men’s Golf Team in 2016. He tied for 37th place out of 60 golfers worldwide and one of his teammates took home the Bronze Medal. During his Rio experience, Fowler said, “Whenever you see someone, you know they’re the best at what they do from their country. It’s inspiring.” Since returning from Rio, Fowler remains on the PGA Tour, competing in more than 45 tournaments and earning an Official World Golf Ranking of 7. Jaimie Thibeault, T’Sou-ke Nation, was a member of the Canadian Women’s Volleyball team in 2016. The opportunity to compete in the Rio 2016 Olympics ended in a three-match sweep against Puerto Rico during an Olympic Qualifying Tournament. Similar to Locklear and Fowler, Thibeault returned to her team in Italy to finish the season. For professional volleyball players, many of their opportunities exist outside of their home countries, and upon her summer return to Canada, Thibeault made the difficult decision to retire. Yet, when a club from Indonesia knocked on her door in December 2016, she decided she would return for a short season in a warm climate – celebrating a last chance on her terms. Jaimie now applies the sport that earned her a full-ride college scholarship to the University of Montana, and her career as a volleyball pro, as a catalyst to encourage youth to stay active and empowered through sports. Being an athlete on any level requires commitment and balance. 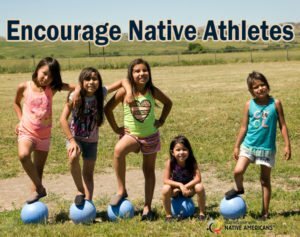 These athletes and all those representing tribal nations, schools, clubs and even countries give us the chance to cheer each other on in the sports we love – and can lose our voices over! This entry was posted in Humanitarian and tagged #Pyeongchang2018, #TeamUSA, athletes, First Nations, Native American, NikeN7, Olympics. Bookmark the permalink. Trackbacks are closed, but you can post a comment. Olympics 2018! Yay! Can’t wait to see my country in a win-win situation! What do you think who will win this year? There has been a substantial improvement in Sports Participation of Native American population in the past decades. They have been actively participating in various games whether its Core Athletics, Basketball or even winter sports as compared to the past. The Winter Olympics which were held recently had a fine number of Native American Athletes who represented the nation in different events. Even if we look some of the games which are still gaining foothold in USA like Netball, Soccer and others have a nice amount of native people. As the training methods in America are among the best in the world, we can hope that these statistics will definitely improve with time. Too bad the indoor volleyball isn’t a part of winter olympics. Olympic Winter Games bring athletes from around the world. Great article. Fantastic site. Plenty of helpful info here. I’m sending it to several buddies ans also sharing in delicious. And naturally, thanks on your effort!